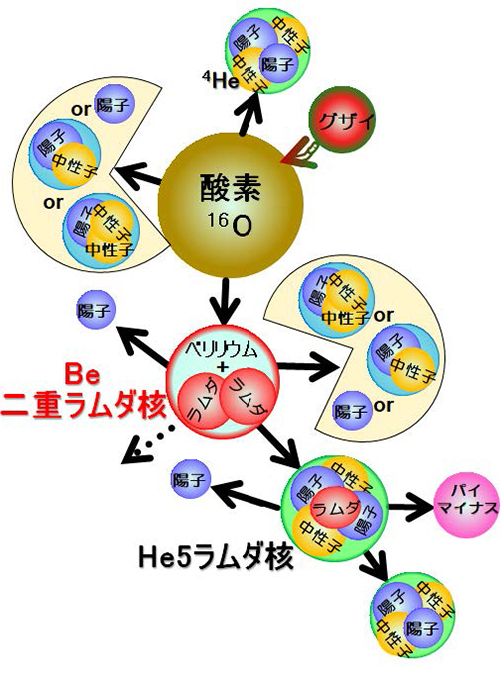 An international research team led by JAEA, Gifu University, J-PARC center, and KEK has detected a new hypernucleus of Bellilium having additional two Lambda particles, so-called "double Lambda hypernucleus (DLH)". One of the goals of modern physics is to understand the mechanism of matter formation through the hierarchical structure from quarks to nuclei. The studies of hypernuclei are essential issues because they extend our knowledge of the ordinary nucleus to the more general nucleus having strange-quark. Particularly, systematic studies of various DLHs are important and challenging issues. We performed an experiment named E07 at J-PARC. It was designed to detect 100 times higher statistics of DLH compared to past experiments with the high-intensity beam of J-PARC. In this experiment, we detected the 2nd identified DLH event named "MINO" and measured its mass. We reconstructed the Lambda-Lambda interaction from the mass. The strength of the interaction was different from that of the 1st identified DLH, so-called "NAGARA". This result is the 1st example that Lambda-Lambda interaction has changed due to the nuclear structure. We will continue the search for new DLHs. DLHs are recorded in photographic emulsion sheets and searched under optical microscopes with automated image recognition. We expect to detect several more new DLHs within a few years. Furthermore, we intend to accelerate the DLH hunting with a new technique, so-called the "Overall scanning method". This result may lead to the understanding of the internal state of neutron stars. Many scientists predict Lambda particles should appear spontaneously in neutron stars by nuclear processes in the high-pressure environment. This result shall be used to validate the scenarios. More details are shown here. 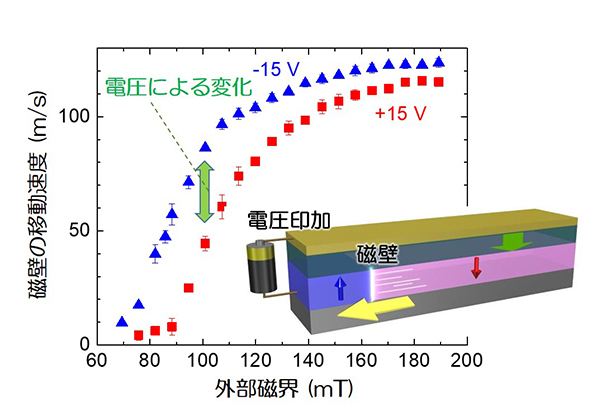 Researchers in U. Tokyo, UEC, and JAEA succeeded in the controlling the high speed motion of a magnetic domain wall (DW) by voltage application. The technology to drive the DW at a higher speed is indispensable for improving the performance of the magnetic memory. To this end, applying voltages to the magnet is a promissing method with high energy efficiency but previous reports were limited to the extremely slow speed operation of 1 mm/sec or less. In this research, it was demonstrated that the DW speed in the region exceeding 100 m/sec is shifted by the voltage. The success in a practical speed region for a memory device is the first time and it opens a way to realize a "race track memory" expected as the ultimate storage memory with high speed, large capacity, high durability. 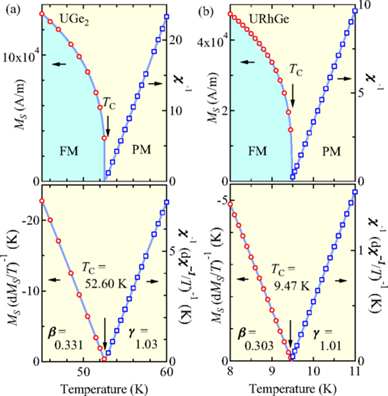 We find the strong correlation between ferromagnetic fluctuations and pressure-induced superconductivity in uranium ferromagnetic superconductor UGe2. It has considered that the ferromagnetism and the superconductivity compete with each other. However, the coexistence of both phases has been discovered in several uranium compound. We show that the ferromagnetic fluctuations enhanced under high pressure may take an important role for the superconductivity. We hope that this study contributes to further developments for a complete understanding of the superconductivity. Researchers in JAEA and RIKEN have developed a versatile angular momentum measuring apparatus to observe the temperature dependent spin of electrons (angular momentum) by rotating the sample at high speed. Moreover, they investigated the magnitude of angular momentum using this apparatus, and observed that the angular momentum disappears with a specific magnetic material. 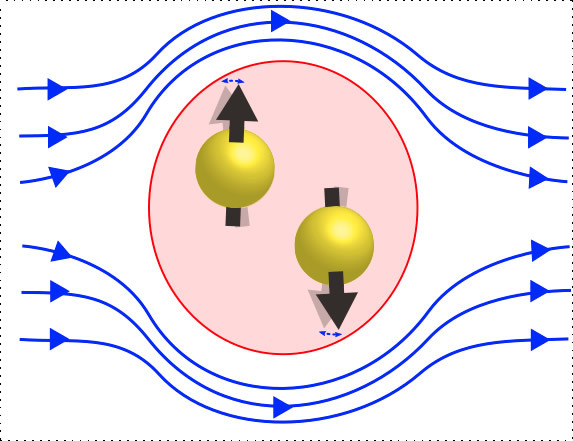 The magnetic reversal process and the angular momentum are closely related, and the magnetic reversal speed is accelerated when the angular momentum is small. 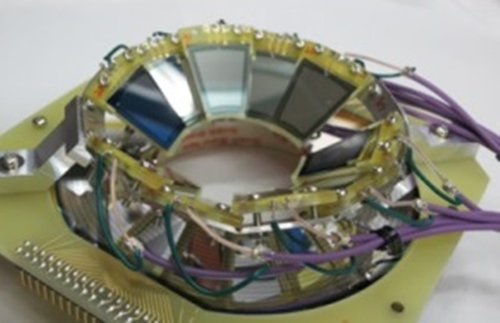 By measuring the angular momentum of various materials with this apparatus, it is expected to search for materials for the next generation high speed magnetic devices. 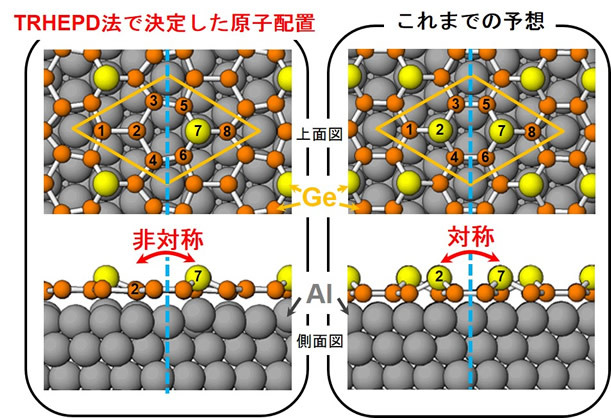 JAEA has discovered a new magneto-optical material, (Fe,FeCo)-(Al-, Y-fluoride) nano-granular films exhibiting giant Faraday effect, 40 times larger than that of Bi-YIG, which has been used for optical communications since 1972. These newly discovered material will contribute greatly to the miniaturization and integration of optical devices. Every March, the American Physical Society (APS) produces a number of short movies showcasing world-leading international research institutes. The Advanced Science Research Center (ASRC) at JAEA was selected as one of the institutes to be portrayed in 2018. The video on ASRC was released in March, and can be found here. 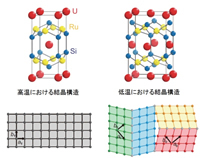 JAEA has succeeded to clarify the mechanism of superconductivity in uranium compound URu2Si2 using JAEA facility; why the superconductivity of this compound can survive under the extremely high magnetic field. So far, experimental resolusion has not been enough due to the difficulty of treating the nuclear fuel material. 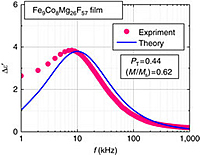 This result can lead development of more useful superconducting magnet. A theory of spin current noise has been constructed in a normal-metal/ ferromagnet bilayer systems. The theory is applied to estimate heat in the spin pumping by micro-waves. It may also be used to obtain high efficiency spin current generation technology. Scientists at Japan Atomic Energy Agency, RIKEN, and Brookhaven National Laboratory shocked by results of spinning protons striking different sized atomic nuclei at the Relativistic Heavy Ion Collider (RHIC) at Brookhaven National Laboratory. Neutrons produced when a spinning proton collides with another proton come out with a slight rightward-skew preference. But when the spinning proton collides with a much larger gold nucleus, the neutrons' directional preference becomes larger and switches to the left. The scientists will execute a new series of experiments colliding polarized protons with other kinds of nuclei to study the electromagnetic interaction effect. ISSP, University of Tokyo and JAEA have found an ordering of electron orbitals at the surface of a heavy fermion superconductor CeCoIn5. By using the highly stabilized scanning tunneling microscopy, they succeeded to directly observe the orbital ordering in real space for the first time. 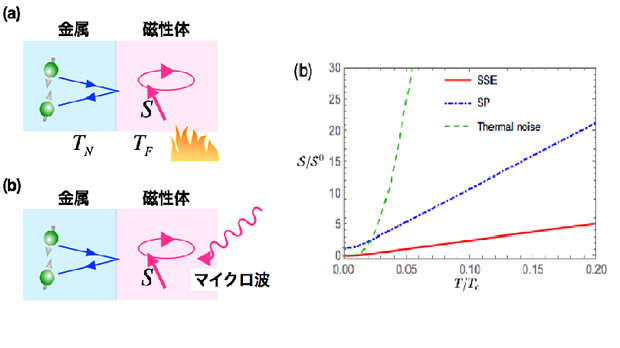 Keio University, Tohoku University, and JAEA succeded in generating "spin current", the flow of magnets by injecting Rayleigh wave into copper. This result is expected to make a significant contribution as a high performance, power saving, and inexpensive rare metal free technology of magnetic devices, which are widely installed in portable information terminals such as smart phones. 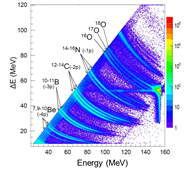 JAEA will obtain einsteinium isotope 254Es (element 99) from Oak Ridge National Laboratory (ORNL). Using the experiemntal setups developed by JAEA in the tandem facility and the SPring-8, experiments such as fission mechanism and hydration structure are planned. 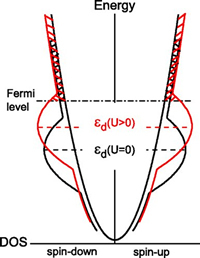 Spinons behave as a Tomonaga–Luttinger liquid at low energy, and the spin system is often called a quantum spin chain. Here we show that a quantum spin chain generates and carries spin current, which is attributed to spinon spin current. 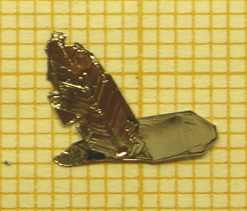 Developing optically transparent magnets at room temperature is an important challenge. They would bring many innovations to various industries, not only for electronic and magnetic devices but also for optical applications. Here we introduce FeCo-(Al-fluoride) nanogranular films exhibiting ferromagnetic properties with high optical transparency in the visible light region. We have determined the structure of germanene, germanium version of graphene, on an aluminum substrate using total-reflection high-energy positron diffraction (TRHEPD) method. The present study revealed that germanene has an asymmetric structure. A new method to obtain fission fragment mass distributions using multi-nucleon transfer reactions was established, which generates data for more than fourteen nuclei at once including neutron-rich nuclei not investigated so far. A fluctuation-dissipation model successfuly explains the measured data. New technology for migration control of cesium from forests to living area. Regeneration of village forests by using natural force with polymers and clay. Evolving verification tests in Iitate village, etc., Fukushima. Expectation for prevention of recontamination of living area. In order to gently regenerate village forests without destroying forest ecosystem, a new technology for migration control of radioactive cesium has been developed. By scattering bentonite that adsorbs cesium on slope grounds covered by leaf soil, the uptake of cesium to plants is suppressed. 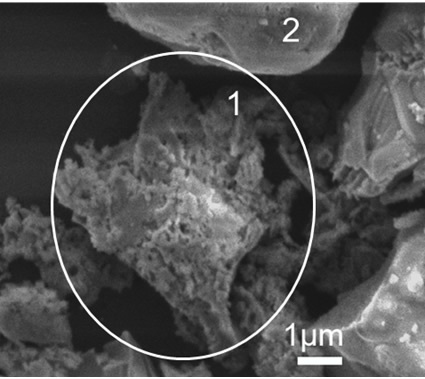 The bentonite adsorbing cesium is transferred by rainwater flow and then captured by interpolyelectrolyte complex (self-assembly of polyelectrolytes having opposite charge by electrostatic interaction). 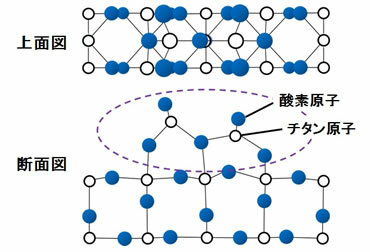 On the basis of large-scale nuclear-structure calculations using the K supercomputer, the most reliable value of the nuclear matrix element for neutrinoless ββ decay in Ca-48 is provided by a collaboration group among the University of Tokyo, Japan Atomic Energy Agency, and other institutes. This data will strongly narrow the range of neutrino masses when the neutrinoless ββ decay in Ca-48 is observed. Collaborative research team of JAEA and KEK experimentally verified using total-reflection high-energy positron diffraction (TRHEPD) that the spacing between graphene and metal substrate depends on the substrate material. 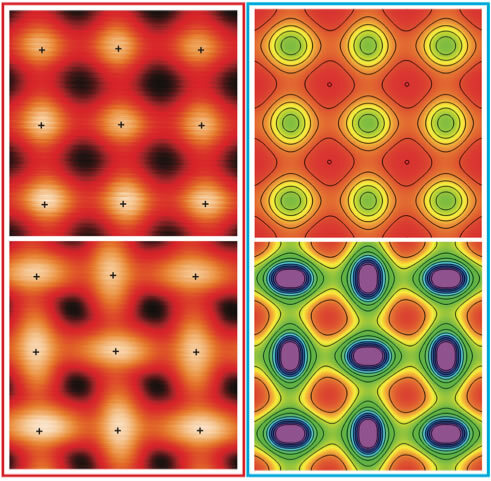 Our research got featured in News&Views of Nature Physics and Nature Materials. Our latest research achievement "Electrical generation from quantum mechanical spinning motion in a liquid metal", press released on November 03, 2015, was featured in News&Views of Nature Physics and Nature Materials. 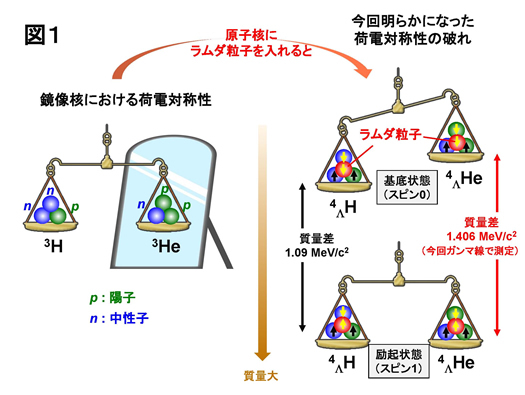 An international collaboration led by Tohoku University, High Energy Accelerator Research Organization (KEK), and Japan Atomic Energy Agency (JAEA) found fundamental symmetry called "charge symmetry" is broken by adding a "strange" particle, Lambda, to a nucleus in an experiment at J-PARC Hadron Experimental Facility. 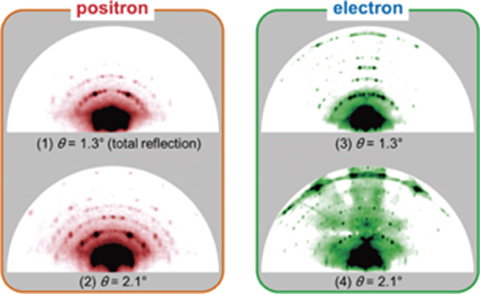 In spin glass metals, where localized moments are polarized in random directions, the relative dynamics between the localized moment and the conduction electron spin is successfully probed by the spin Hall effect. Such spin dynamics is very difficult to be detected even by the superconducting quantum interference device (SQUID), the most sensitive magnetometer at the present stage. Such technique can be applied to develop the highly sensitive magnetic sensors. The team found a new method of power generation by using electron spinning motion in a liquid metal via the quantum mechanical coupling between electron and fluid vorticity. The result can be used as an electric generator and a spin generator in, e.g., micro-electromechanical system free from magnetic fields. 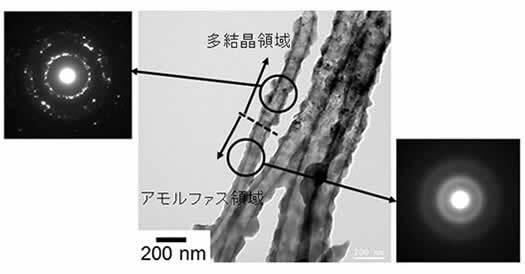 We have succeeded the development of synthesis process of novel composite nanotubes, which are consisted of different crystal states or new microstructures, using ion irradiation technique. ・First demonstration of the spin-Hall effect in a superconductor. 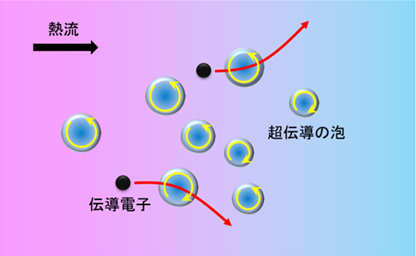 ・More than 2000 times enhancement of the effect has been achieved compared to the normal conductor case. ・This finding opens the door to next-generation spintronics devices such as a "spin-meter" that magnifies and detects tiny spin signals. 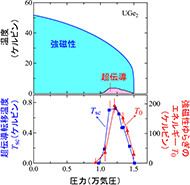 Reentrant superconducitivity has been discovered in uranium based compound URhG under strong magnetic fields. We have revealed the noevel mechansim of this exotic phenomenon by means of Nuclear Magnetic Resonance (NMR) technique. Tetsuya　K. Sato et al. 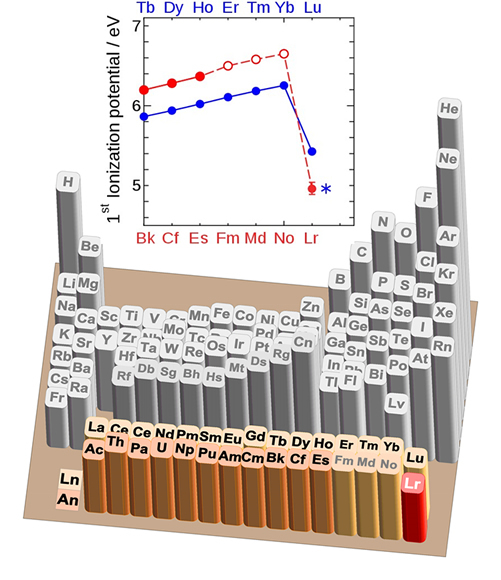 We report that the experimentally obtained the first ionization potencial of the heaviest actinide, lawrencium (Lr, atomic number 103), is 4.96 eV. 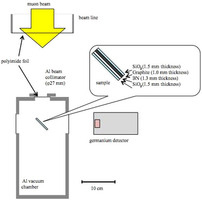 The value was measured with Lr-256 (half-life 27 seconds) using an efficient surface ion-source and a radioisotope detection system coupled to a mass separator at the JAEA tandem accelerator. The measured ionization potencial is in excellent agreement with the value predicted here by state-of-the-art relativistic calculations. 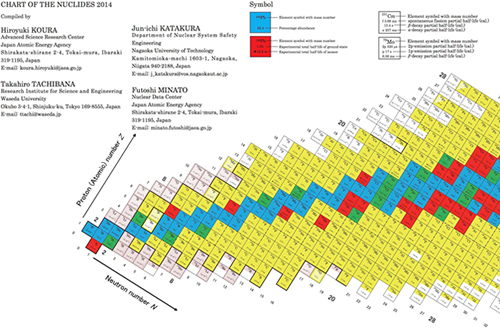 We have constructed a folding (A4-size) nuclear chart, “JAEA Chart of the Nuclides 2014,” including the latest experimental (3,150 points) and theoretical (1,578 points) decay data for nuclear science experts and the general public. A conversion of light energy into spin currents in magnetic insulators is demonstrated for the first time with the aid of "surface plasmon", a collective excitation of electrons in metal nanoparticles under light illumination. We have theoretically shown that electron-electron correlation is necessary to reproduce the experimental results of the spin Hall effect in Ir-doped Cu. Concerning the phonon Hall effect, it has not been clarified the mechanism why a heat current is changed by a magnetic field. We theoretically show that this effect is due to resonant skew scattering of phonons from a tiny amout of magentic impurities. 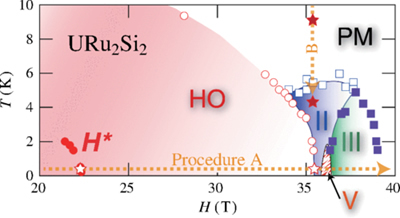 Thermomagnetic effect was investigated on an ultra-clean single crystal of a uranium superconductor URu2Si2. Colossal thermomagnetic response a million times larger than the theoretical prediction has successfully been detected. This observation proofs the superconducting fluctuation in this material. We have revealed the chemical states of radioactive cesium in the sewage sludge ashes produced after the Fukushima Daiichi nuclear power plant accident and have succeeded in recovering more than 90 % of radioactive cesium in the ashes by pre-pulverizing the ashes to particles less than 1 µm and heating them in acid solutions. 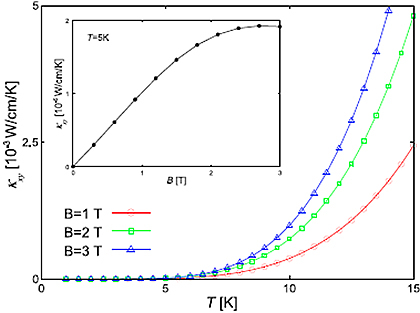 Mottled electronic state is found in an Yb-based compound around a magnetic field induced quantum critical phase transition at low temperatures. For the first time, a chemical bond was established between a superheavy element – seaborgium (element 106) in the present study – and a carbon atom by an international collaboration with research groups from Univ. Mainz, GSI and RIKEN. Seaborgium were converted into seaborgium hexacarbonyl complexes. 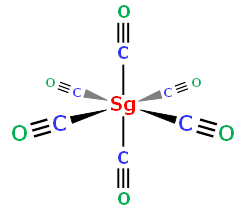 Its gaseous properties and adsorption to a silicon dioxide surface were studied, and compared with similar compounds of neighbors of seaborgium in the same group of the periodic table. We have developed an novel spectroscopic technique, using high brilliant X-rays provided by SPring-8, to study synergy effect of radiation and water on the processes of DNA damage induced by radiation. The newly developmed material is a thin-film dielectric material consists of metal and insulator phases, in which nano-magnetic particles have been dispersed in a inslator matrix. This so-called nanogranular material shows giant dielectric and magnetoelectric responses at room temperature. 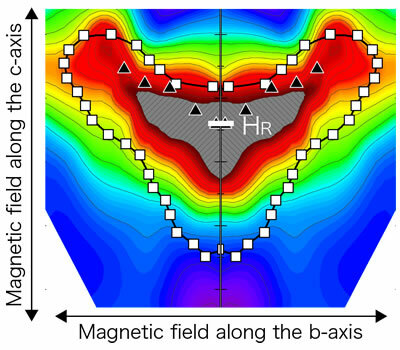 We have found new phenomenon of magnetism in uranium ferromagnetic superconductors UGe2 and URhGe where the ferromagnetism and superconductivity co-exist. 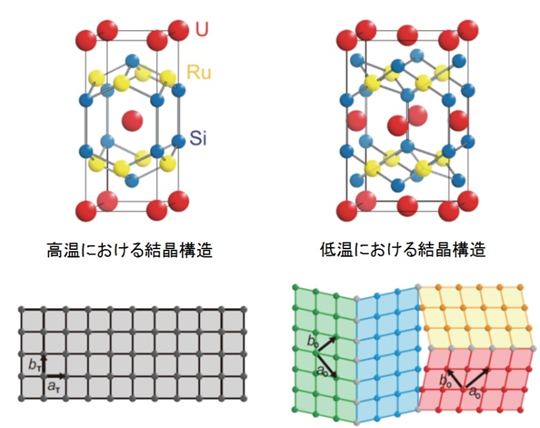 Deformation of the crystal lattice was detected in the hidden-order phase of URu2Si2 by using an ultra high-resolution crystallography with synchrotron radiation at SPring-8. 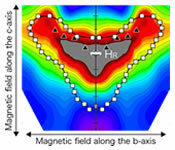 An unknown magnetic structure in uranium compound URu2Si2 induced by high field over 35 tesla, has been determined by means of nuclear magnetic resonance technique. The experiment was performed using the world's strongest magnetic field in National High Magnetic Field Laboratory (NHMFL) in Tallahasee, USA. By using the most intense pulsed muon beam at J-PARC MUSE(MUon Science Establishment), we successfully demonstrate a depth-profile analysis of light elements (B, C, N, and O) from several mm-thick layered materials and non-destructive bulk analyses of meteorites containing organic materials. We have developed a unique conceptual measurement system of nucler spin of materials in rotoational speed of 10000 times per 1second based on nuclear magnetic resonance method. Kawasuso, Group Leader, and his colaborators received the above award. We improved the total reflection positron diffraction method by enhancing the brightness of positron beam at KEK slow positon facility. 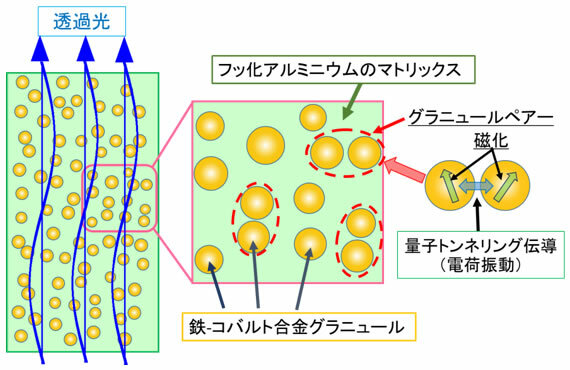 20th gold medal prize, "discovery of electric spin curent fandamentals"
This prize is one of the prestigious prize in Science for Japanese scientist. Yomiuri Tchno Forum selects luminary scientists 3 or so per a year. "Notes on Basic Science Vol.40" was published. Applications (Recruitment for a mid-career JAEA Staff (woman only)) is announced. The Reimei Research program 2019:Call for proposals is announced. ASRC Seminar(ASRC Lecture Series 2nd) is announced. The brochure has been renewed. Annual Report of ASRC 2017 was updated. ASRC Seminar(ASRC Summer School) is announced. ASRC Seminar(ASRC Lecture Series 1st) is announced. Applications (Tenure-tracking employment: Leading Initiative for Excellent Young Researchers FY2018 (LEADER)) is announced. "Notes on Basic Science Vol.39" was published. The APS video on the Advanced Science Research Center at JAEA has been released. The Reimei Research program 2018:Call for proposals is announced. 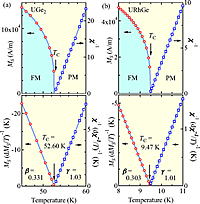 Physics of Uranium based Unconventional Superconductors is announced. Annual Report of ASRC 2016 was updated. Applications (Tenure-tracking employment: Leading Initiative for Excellent Young Researchers FY2017 (LEADER)) is announced. "Notes on Basic Science Vol.38" was published. Project JAEA(Recovering Satoyama in Fukushima - New Technique to Suppress Migration of Radioactive Cesium from Forests -) is announced. Applications (Special Topic Researcher) is announced. REIMEI International Workshop: Radionuclides Remediation and Clean-Up is announced. The 37th REIMEI Workshop on Frontiers of Correlated Quantum Matters and Spintronics is announced. The Reimei Research program 2017:Call for proposals is announced. ASRC Seminar(652nd,3rd ASRC TPI Theory Lecture Series) is announced. 40th ASRC International Workshop "Experimental and Theoretical Advances in Fission and Heavy Nuclei " is announced. Annual Report of ASRC 2015 was updated. The 34th Reimei Workshop "Physics of Heavy-Ion Collsions at J-PARC" is announced. "J-PARC Workshop 2016: From Exotic hadrons to QGP -The 33rd Reimei Workshop-" is announced. The home page of "Future J-PARC Heavy-Ion Project" has been released. The 28th Reimei Workshop on Radioactive Waste Treatment and Remediation is announced. "The 31st Reimei WorkShop on Hadron Physics in Extreme Conditions at J-PARC" is announced. The Reimei Research program 2016:Call for proposals is announced. Theory Lecture Series(2nd) is announced. "32nd Reimei Workshop on Frontiers of Condensed Matter Physics (Spintronics with Antiferromagnets)" is announced. "The 29th REIMEI and ERATO-SQR Workshop on (Spin orbit coupling and spin mechanics)" is announced. Annual Report of ASRC 2014 was updated. 1st ASRC TPI Kickoff meeting is announced. Applications (Recruitment for Postdoctoral Fellow(Fixed-term researcher)) is announced. Theory Lecture Series(1st) is announced. "4th Super-PIRE - 26th REIMEI Workshop on Frontiers of Condensed Matter Physics" is announced. Applications (Senior Post Doc.) is announced. 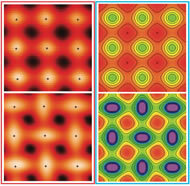 "New Insights in the Physics of Magnetic Nanostructures" is announced. The Reimei Research program 2015:Call for proposals is announced. "Notes on Basic Science Vol.37" was published. "Progress on J-PARC hadron physics in 2014" is announced. Applications (Fellow of Advanced Science) is announced. ASRC Seminar(576th , 577th) is announced. "IMR-ASRC 5th REIMEI International Workshop" is announced. ASRC Seminar(574th , 575th) is announced. ASRC Seminar(571st , 572nd) is announced. ASRC Seminar(569th , 570th) is announced. ASRC Seminar(567th , 568th) is announced. 22nd ASRC International Workshop " Nuclear Fission and Exotic Nuclei "
ASRC Seminar(564th , 565th) is announced.